But you didn't tell me his name.' 'It's Bond, sir,' the Chief of Staff replied. But not this time. 007 floats in the waters of Marseille, killed by an unknown hand. It's time for a new agent to step up. Time for a new weapon in the war against organised crime. It's time for James... read full description below. The sea keeps its secrets. But not this time.One body. Three bullets. 007 floats in the waters of Marseille, killed by an unknown hand.It's time for a new agent to step up. Time for a new weapon in the war against organised crime.It's time for James Bond to earn his licence to kill.This is the story of the birth of a legend, in the brutal underworld of the French Riviera. 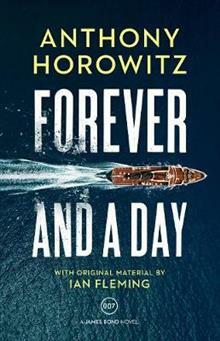 Anthony Horowitz is one of the most prolific and successful writers working in the UK. He has written over 40 books including the bestselling teen spy 'Alex Rider' series, which is estimated to have sold 19 million copies worldwide. Anthony is also an acclaimed writer for adults. He was commissioned by the Conan Doyle Estate to write two new Sherlock Holmes novels; The House of Silk was published in November 2011 and was internationally lauded as the top title of the autumn. The sequel, Moriarty, was published in October 2014 with similar success. The Ian Fleming Estate then asked him to write a continuation James Bond novel,Trigger Mortis, and in 2016 he became the first writer to be invited to produce a second, with a release scheduled for May 2018. His standalone novel, Magpie Murders, was released in October 2016 to critical acclaim and 2017 saw the release of The Word is Murder, the first in a series of detective novels. Anthony is also responsible for creating and writing some of the UK's most beloved and successful television series, including Midsomer Murders and Foyle's War. In 2014, he was awarded an OBE for his services to literature.